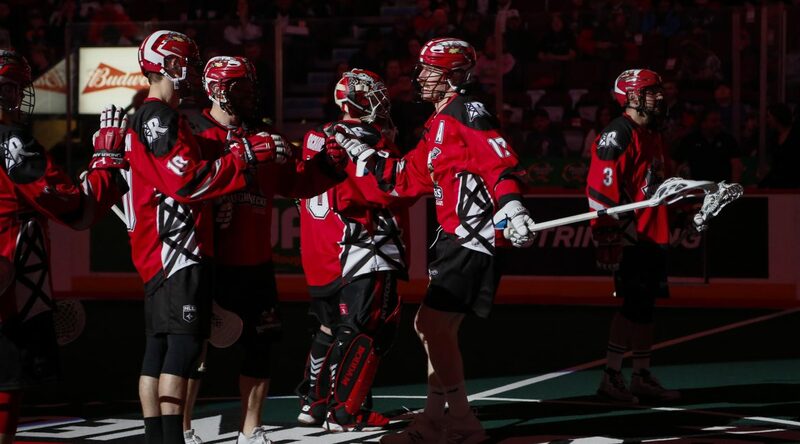 RIGGER RAMBLINGS: The Calgary Roughnecks will look to build upon last Saturday’s victory this evening when the San Diego Seals visit the Scotiabank Saddledome. Game time is 7:00 p.m. and players will sport rainbow tape on their sticks in support of You Can Play. Swift Olliver will perform live during the halftime show while the Dueling Piano Kings are performing in the Chrysler Club for the post-game party. The Riggers were last in action on Mar. 23 when they returned to .500 with a 12-9 victory over the Rochester Knighthawks at the Blue Cross Arena. The Knighthawks held a 7-6 advantage heading into halftime but the Roughnecks broke out ahead with the help of Curtis Dickson (5g, 9a) who netted three second-half goals and posted a game leading nine-point effort. Dane Dobbie was the other top point producer for Calgary with a hatrick and three assists. Calgary goaltender Christian Del Bianco stood tall between the pipes stopping a season high 48 out of 57 shots on goal to record the win. VS. SAN DIEGO: Tonight marks the third and final regular season meeting between the two West Division rivals. The series is split 1-1 as Calgary took the series opener on Dec. 28 by a score of 9-5 while on Jan. 18, San Diego brought down the Roughnecks 15-9. The Seals are coming off last Friday’s 13-12 victory over the Saskatchewan Rush, which extended their winning streak to four games. Calgary is 3-3 when playing at the ‘Dome this season while San Diego is 3-3 on the road. Dec. 28/18 at CGY: CGY 9 SD 5… Roughnecks held the Seals to three first half goals en route to a 9-5 victory. Jan. 18/19 at SD: SD 15 CGY 9… Seals built quarter leads of 3-2, 8-5 and 14-6 en route to a 15-9 triumph. ROUGHNECKS VS. DIVISION: West (5-5), East (2-2). PLAYOFF PUSH: Heading into tonight, Calgary has an opportunity to clinch the second playoff spot in the West Division. The Roughnecks can clinch their playoff berth by defeating the San Diego Seals or with a Vancouver loss to Saskatchewan. Calgary is one win back of first-place San Diego who clinched a post-season spot last weekend with a victory over the Saskatchewan Rush. In their 18-year history, the Riggers have only missed the playoffs twice: in 2002 and 2017. 400 CLUB: Dane Dobbie recorded his 400th career goal on Mar. 16 in an 11-9 loss to Colorado. He became the 13th player in league history to hit this milestone and the first player in team history to score all 400 goals as a member of the Roughnecks. Teammate Rhys Duch is just seven goals back from hitting the 400 mark. Former NLL players who suited up for Calgary and reached 400 goals include Josh Sanderson (449), Lewis Ratcliff (440) and Shawn Evans (428). AUCTION ALERT: As part of the Del Bianco Assists for Kids program, the Calgary Roughnecks goaltender will be auctioning off his game-worn helmet from the 2018-19 NLL campaign. The auction opens tonight at 7:00 p.m. and closes on Apr. 14 at 8:00 p.m. with proceeds to support KidSport Calgary. To place your bid, visit elevateauctions.com/DelBiancoKidSportAuction. IN THE COMMUNITY: Run with the Roughnecks returns tomorrow, Mar. 31 from 9:30 a.m. to 1:00 p.m. Young lacrosse players and youth interested in trying lacrosse are invited to a hands on instructional clinic with Roughnecks players at the Calgary Soccer Centre (7000 48 St. SE). This sold out event is open to youth ages 6-16 with groups formed based on age and skill level. RIGHT TO PLAY: The NLL has launched the seventh consecutive league-wide fundraising campaign for Right To Play, a global organization that uses the power of play and sport to improve the lives of children and youth affected by conflict, disease and poverty. Defenseman Zach Currier will represent the Roughnecks as Calgary’s “Champion” for this campaign. Fundraising began Mar. 4 and has been extended to Apr. 11 when donation pages and the online auction featuring team signed jerseys from all 11 active NLL franchises close. Help Currier in supporting this great cause by making a donation today at calgaryroughnecks.com/play. ROUGHNECKS IN THE NLL TOP 10: Dane Dobbie leads the NLL with 158 shots on goal and with 220 shots. He is tied for third in the league with 84 points including 33 goals and 51 assists (both tied for fourth). Dobbie is in a four-way tie for first with four game winning goals. The forward is tied for third in power play goals with nine and tied for second with 14 power play assists… Rhys Duch matches Dobbies nine power play goals… Zach Currier leads the league with 155 loose balls and is second with 28 caused turnovers… Dan MacRae is fourth in caused turnovers with 23… Eli Salama leads all rookies with two shorthanded assists and is ninth out of the rookies with 47 loose balls. His 10 caused turnovers put him at sixth among rookies… Christian Del Bianco’s 10.78 goals against average puts him at fourth in the NLL while his 0.788 save percentage is fifth in the league. MILESTONE MARKERS: On Mar. 16, Dane Dobbie surpassed 400 career NLL goals while Tyler Burton eclipsed 900 face-off wins that same night. On Mar. 9, Curtis Dickson surpassed 300 assists and picked up his 500th loose ball. On Mar. 2, Mitch Wilde scooped up his 300th loose ball while Zach Currier hit the same milestone on Feb. 16. On Feb. 9, Dane Dobbie surpassed 800 NLL career points while Tyler Burton eclipsed 500 loose balls. On Feb. 2, Rhys Duch scooped up his 800th loose ball. On Jan. 20, multiple players hit milestones: Dane Dobbie recorded his 400th career assist while Mitch Wilde recorded his 50th career helper and Riley Loewen eclipsed 200 loose balls. WHAT’S LEFT: Week 17 sees the Roughnecks embark on their final road trip of the regular season with a visit to the Wells Fargo Center to take on the Philadelphia Flyers. Philadelphia, which was awarded an NLL expansion team in September of 2017, has a record of 3-10 in their inaugural season. The Riggers then head back to the ‘Dome to finish out the 2018-19 NLL campaign with a two-game home stand facing the Georgia Swarm on Apr. 13 for SUPERHEROES Night and the Saskatchewan Rush on Apr. 20 for Fan Appreciation.